THE Aircoin is a platform and an ecosystem for building and deploying decentralized blockchain applications. What problems can THE Aircoin solve? THE Aircoin aims to build a scalable, extensible, and easy-to-use platform for building and deploying decentralized blockchain applications. THE Aircoin's primary goal is to remove the barriers that have slowed blockchain adoption among the general public. We're also passionate about developing unique approaches that will significantly advance blockchain development. 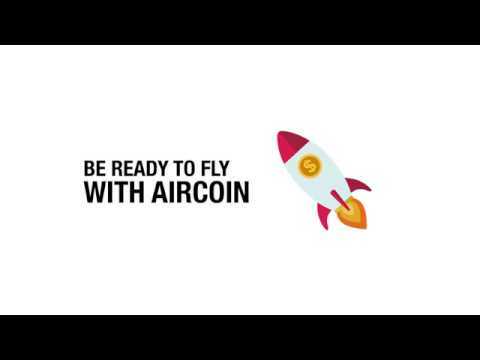 AirCoin is a platform and an ecosystem for building and deploying decentralized blockchain applications. The platform goes beyond providing the necessary foundational components for using blockchain to power complex business rules. It connects your existing system to blockchain networks, enabling you to automate business processes using the data and identities associated with existing systems. AirCoin’s primary goal is to remove the barriers that have slowed blockchain adoption among the general public. We’re also passionate about developing unique approaches that will significantly advance blockchain development. Launch first decentralized apps built on Aircoin with selected clients. Launch Open Chain Access Protocol and reference implementations for major blockchains (Ethereum, Hyperledger, etc.). Public launch and popularization among the general public. First Developer Conference for Aircoin developers and partners. Launch the support and Blocklet Building Blocks for digital media, publishing, and knowledge sharing. Build the decentralized marketplace for Aircoin decentralized applications and their tokens. Public launch for IoT smart home and smart city application support. Contribute Open Chain Access Protocol and related technology to the open source community (through the Linux Foundation, Hyperledger Foundation, or a similar organization) to increase adoption and position Aircoin as the de facto standard of open chain access. Extend cloud computing support for the Aircoin platform, targeting support for all major cloud platforms including AWS, Windows Azure, Google Computing Engine, Aliyun, Tencent Yun, etc. Aircoin is aiming for a cloud platform-independent, universal, and decentralized application platform. Embrace the potential trend that blockchain protocols may be adopted at the OS (operating system) level by providing foundational OS-level support in the Aircoin Platform. Build the token ecosystem and a new operating system with Aircoin platform partners and developers for a truly decentralized, autonomous business environment. Aircoin becomes an open, foundational service of the new programmable society, supporting the DAO/DAC and their services/applications.